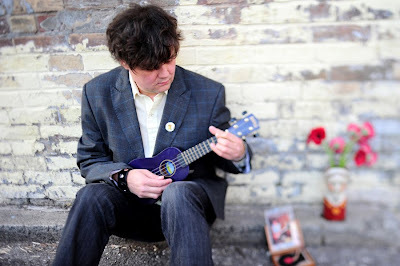 I wrote about Ron Sexsmith a few years ago and how consistently great his albums have been for the past fifteen years. It turns out that his last one, Exit Strategy of the Soul, which I thought was fantastic, didn't sell very well, and neither did the one before. Ron apparently got pretty depressed about what felt like his disappearing career and even considered giving up music for a while. Some of this mood is cataloged in Love Shines, a new documentary about the making of Sexsmith's most recent album, Long Player, Late Bloomer. Ron's management was nice enough to send me the DVD, which isn't available yet, because I was interviewing him over the phone for Time Out Boston. The interview has just been posted, and you can read it here. He is one of my heroes, so it was an honor to speak to him. About the album, Long Player, Late Bloomer is another wonderful collection of songs, and a fine place to start if you're not already a fan. During the first few listens, I'll admit I was put off by the production. Sexsmith apparently wanted a more commercial sound on this album and brought on a bigtime producer, Bob Rock, to gloss things up a bit. A lot of the songs, as a result, feel less intimate, vaguely smoothed over. One track, "No Help At all," has a slinky synthesized riff played on a keyboard that sounds like it has been set to "Disco Flute." Pretty soon, though, the lyrics and the melodies start to shine through the saran wrap. I even began to appreciate some of Rock's touches, especially on songs like "Believe It When I See It" and "Love Shines," where his production gives the songs an anthemic energy that is something new in Sexsmith's music. Long Player, Late Bloomer also feels cohesive in a way that most of Ron's albums do not, because there is an emotional arc that connects the songs to each other, involving, I think, the descent into depression and the slow climb back out. The album begins with a song about purely personal gripes ("Get In Line") and then moves from confusion about the purpose behind things ("The Reason Why") to a kind of a cosmic despair ("Believe It When I See It"), which is probably the most pessimistic song Sexsmith has ever written. After a glimmer of light on "Miracles," we get "No Help At All" (the disco flute track) which begins to view the depression from outside, with some tongue-in-cheek humor, a signal that the darkness is clearing. And the album then moves from guarded hopefulness to, finally, a kind of radiant acceptance. Not every song fits with this concept -- even Willie Nelson can't hold an entire concept album together -- but the odd-man-out tracks from the second half of the album (which is a bit weaker) still capture a branching out, a growing interest in the world, that fits with the idea of moving from inward gloom to something larger than the self. For a while, I've been giving people Sexsmith mix CDs, and when they don't quite get my enthusiasm -- and many of them don't -- I end up stammering something about melodic complexity or sincerity or about how well the lyrics are put together. I have a hard time explaining why this music is so important to me, why it keeps on giving me sustenance when so many other works of art that I like, from movies to books, seem to exhaust themselves after a few encounters. All I can say -- and this is just another kind of stammering -- is that I can hear the same divine spark in Sexsmith that Beethoven heard in Schubert, and that anyone who listens to Winterreise or the last piano sonata or dozens of Ron's songs can feel as well. That this spark can be communicated, and is offered to us for the price of a little attention, is something of a miracle -- one of the miracles that, as Ron sings, keep appearing in broad daylight. Pick up this album or any of his others: I hope the spark comes across.